Freedom Rockz: Free Grilled Cheese Day! Get a free Classic Grilled Cheese on the 3rd Annual Grilled Cheese Day April 26, 2013. 1:00 pm- 6:00m. 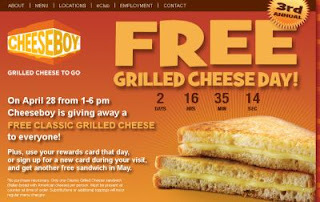 Click the link below to go to the Cheeseboy website to see how to get your free Grilled Cheese.